Beginning this month, the largest exercise of the democratic franchise in history will take place, as Indian voters are heading to the polls to elect a new national parliament. They have done this 14 times since India gained its independence. Each time India has voted has been the world's largest exercise in electoral democracy. India's growing population keeps breaking its own record. This time, the electorate includes 714 million voters, an increase of 43 million over the previous general election in 2004. Votes will be cast in 828,804 polling stations scattered throughout the country for over 5000 candidates from seven national political parties and several state and other parties. The process involves four million electoral officials and 6.1 million police and civilian personnel. The numbers involved are so huge that the elections will be staggered over five phases, ending only on May 13, with electoral and security personnel being moved from state to state as polling is concluded in each place. Despite the phased voting, the counting takes place nationwide immediately after the last phase, and the results of the elections everywhere will be announced on May 16. A new parliament will be convened on June 2 to elect a national government to succeed the outgoing administration of Prime Minister Manmohan Singh. Nor is any Indian election complete without the media publishing at least one picture of a female voter whose enthusiasm for the suffrage is undimmed by the fact that she is old, blind, crippled, toothless, purdah-clad, or any combination of the above. The exotica do not end there. Because so many voters are illiterate, India invented the party symbol, so that voters who cannot read the name of their candidate can vote for him or her anyway by recognising the symbol under which they campaigned. Symbols range from the open palm of the ruling Indian National Congress to the lotus of the Bharatiya Janata Party and variants of the hammer and sickle for India's profusion of Communist parties. India was also the first country to use an indelible stain on the voter's fingernail to signify that he has already cast his ballot. At every election, someone "discovers" a new chemical that will remove the stain and permit one to vote twice, though this is unlikely to make a great difference in constituencies the size of India's, where each member of parliament represents more than two million people. Likewise, some distinguished voter invariably claims that his name is missing from the rolls, or that someone has already cast his vote (but usually not both). In any case, India's elections have a reputation for honesty. In this election, as in previous ones, votes will be cast on electronic voting machines invented in India, which combine the virtues of simplicity, reliability, and ruggedness. 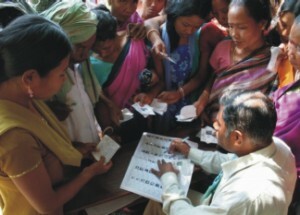 The electoral rolls carry photographs of every individual voter, as does each voter's identity card. The elections have also been increasingly free of violence. There was a time when, in certain parts of India, workers could stuff ballot boxes for a candidate and political parties could "capture" polling booths. Electronic voting machines and strict security arrangements have largely eliminated that possibility. It has been some time since there were reports of the occasional election worker, candidate, or voter being assaulted, kidnapped, or shot. Nothing (short of the death of a major contender) interrupts the franchise. Elections are an enduring spectacle of free India, and give foreign journalists the opportunity to remind the world that India is the world's largest democracy. Indeed, Indians now take for granted that elections will take place, that they will be free and fair, and that they will result in actual transfers of power. There are few developing countries in the world where this is true, and fewer still where poverty and illiteracy are both rife. That may be the real miracle of what will occur in India over the next few weeks.